Sorbet Peony | Henry Field's Seed & Nursery Co.
Peonies are a one-time investment for a lifetime of beauty! Single planting may provide fragrant beauty for several generations since roots can be divided again and again. 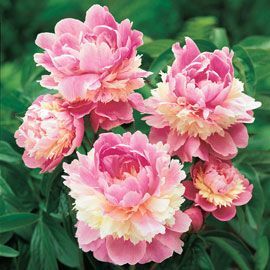 Sorbet Peony is white and pink with 5-7" double blooms that make their appearance in early summer with foliage that turns red in the fall. Be sure to plant single plants 2-4' apart with eyes (new buds at the crown) no more than 2" below soil level. Apply fertilizer and/or compost in the spring for an otherwise easy-to-grow flower. Plant in full sun or partial shade with well-drained soil. Bareroot. Zones 3-8. Color: Deep pink outer petals with white and pink center. Foliage: Glossy, deep green leaves. Very ornamental through-out the growing season. The new growth in spring is a copper-burgundy and turns a soft yellow in the fall. 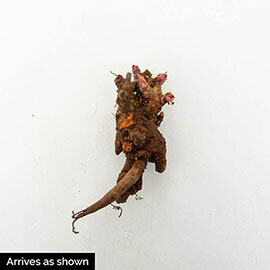 Pruning: Remove spent flowers after blooming. Cut foliage to the ground (and remove from the garden) in the Fall after frost.